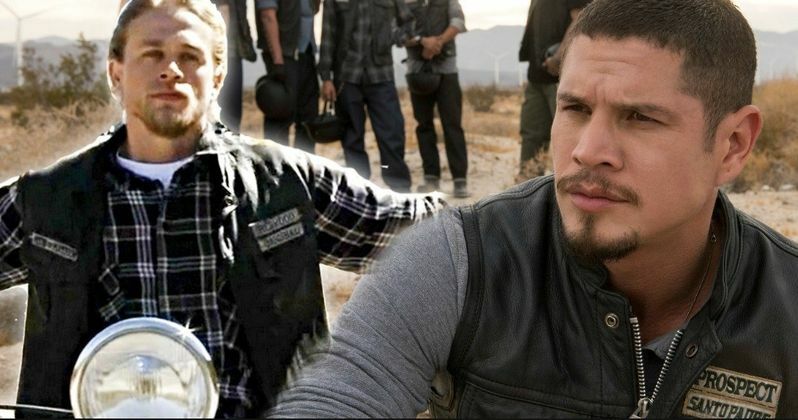 Mayans MC will intersect with the world of Sons of Anarchy. Creator Kurt Sutter helped close out San Diego Comic-Con with one of the final panels of the weekend for the upcoming spin-off. In addition to showcasing 15-minutes of footage from the premiere episode, which features the new crew on a run to Las Vegas that doesn't go according to plan. The cast and members of the creative team behind the show were at the convention center to discuss the new series and reveal what their show, which is set in a post-Jax world, is going to be. Producer Elgin James and executive producer Norberto Barba were on hand with Kurt Sutter. Cast members Emilio Rivera, J. D. Pardo Edward James Olmos, Clayton Cardenas, Sarah Bolger, Michael Irby, Carla Baratta, Antonio Jaramillo, Raoul Max Trujillo, Richard Cabral, Danny Pino, Frankie Loyal, Joseph Lucero, and Vincent "Rocco" Vargas were all also at the event to build hype for the spin-off. Sutter said during the panel that he doesn't "want to f***" with the original show, but that Mayans MC will intersect with Sons of Anarchy". Here's what he had to say about it. "Right now, there is no intersecting stories. But Sons is a big world...We'll see those points of intersection this season and throughout the series as well...I want to acknowledge that world and find opportunities to circle that, but I don't want to abuse it." He added, "For now, keep it sacred." Elgin James said, "A lot of us have been in prison and a lot of us have spent a lot of our life in gangs...we finally get to tell our own story," while discussing the authenticity that this show is going to have. Kurt Sutter elaborated on that a bit, joking that he didn't set out trying to cast guys right out of being locked up, but that the authenticity is very important. "It's not like I began my casting process in county. But a lot of these actors come from the life, and that authenticity is important to me. Quite selfishly, the energy of those men and women who know that they should be somewhere else and have been given the opportunity for a second chance, you can't bottle that. It's magic on set. Everyone's there to do the work." FX dropped the Mayans MC Comic-Con trailer for the series online ahead of the SDCC panel, which was a bit unexpected but served as a nice surprise for those who couldn't attend the event this year. It was also revealed that Mayans MC, which premieres on FX September 4, picks up three years after the events of Sons of Anarchy. The show's first season will consist of 10 episodes. You can check out some photos from the panel for yourself below. This news comes to us courtesy of Deadline.